This event is held from the vernal equinox in March to April every year when relatives gather to clean the tombs and surrounding areas. 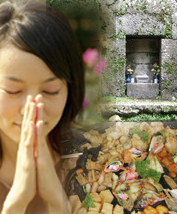 After cleaning they offer ceremonial foods, beer, and awamori to their ancestors to comfort the spirits, and then have a picnic for themselves at the gravesite. The foods are mostly tempura, pork (rafute), fried tofu, burdock root ant other local delicacies.